Here is the happy family! 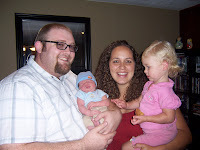 Our son Ashton holding GW, Elena holding Maddy girl. Maddy is a little bit wanting her Mommy. I think she is worried that Mommy might leave again. 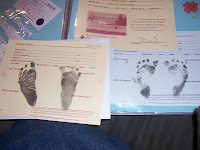 This is GW and Maddy's footprints. the ones on the left is GWs. on the right is Maddy's. GW's foot prints are LOOOOOONNNNNNGGGG and skinny. Maddy's was the complete opposite. He wanted to nurse and stay awake all night. poor parents. we all are hoping tonight will be better!